LLCs are designated as limited liability companies for a reason. They limit the liability you might incur as an individual in a business or venture. For example, if a vacation tenant slips and falls in your condominium, she could sue the condo owner for any compensatory or punitive damages. If you hold title to the condo in the name of your LLC at the time of the accident, any judgment rendered by the court in her favor should, under most circumstances, attach to the assets of the LLC, not your individually-owned home or other properties. In addition, if the LLC incurs debt in its name, the debt will not generally attach to the assets of the individual. Unlike corporations, profits from your investment in an LLC may pass through to your individual tax return, eliminating the need to file a separate return for the company. Therefore, LLCs avoid double-taxation which occurs with some corporate structures. If you own real estate in the name of your LLC, not only will business profits be reflected on your tax return, but business losses from the sale of real estate may be claimed as well. Often, however, if you must borrow money to purchase the vacation property, lenders will refuse to lend money to an LLC. They may require that you hold title to the property as an individual before they will authorize the loan. Even if the lender allows you to purchase the property in the name of the LLC, you may be required to sign a personal guarantee holding you personally liable for any debt not recovered by foreclosure of the property. Although some states allow the formation of sole-member LLCs, they are frequently formed with several members. 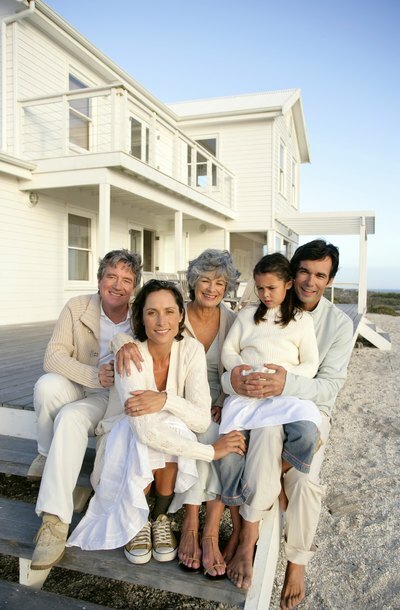 In the case of a vacation home, immediate family or even close relatives may band together to form the LLC. As with any venture, the more people are involved, the more chance for there to be disagreement related to the operation of the LLC and its assets. It would be wise to have an air-tight operating agreement establishing the rules and regulations of the LLC as well as the responsibility of its individual members. Bankrate.com: Inc. vs. LLC: Which legal structure suits your business?